6th-8th September 2019, Warwick University. This weekend has been set up by OUPS to help students who are about to start SDK228 to prepare for the course. For many of you, this might be the first time you have studied a subject like the science of mental health. The weekend school is intended to give a very gentle ‘hand-holding’ guide to SDK228. It will present a foundation for your studies by providing you with an overview of the important aspects of the course and giving you a framework for studying the course. It may also be of interest to those people who are interested in mental health issues even if you are not studying the course. It examines the extent to which we can understand mental wellbeing and treat mental health conditions such as depression and dementia by focusing on the brain and its functioning. To present a weekend of lectures which offer a broad look at SDK228. The weekend will introduce some of the more accessible parts of the course as well as some of those likely to give trouble (based on past experience). 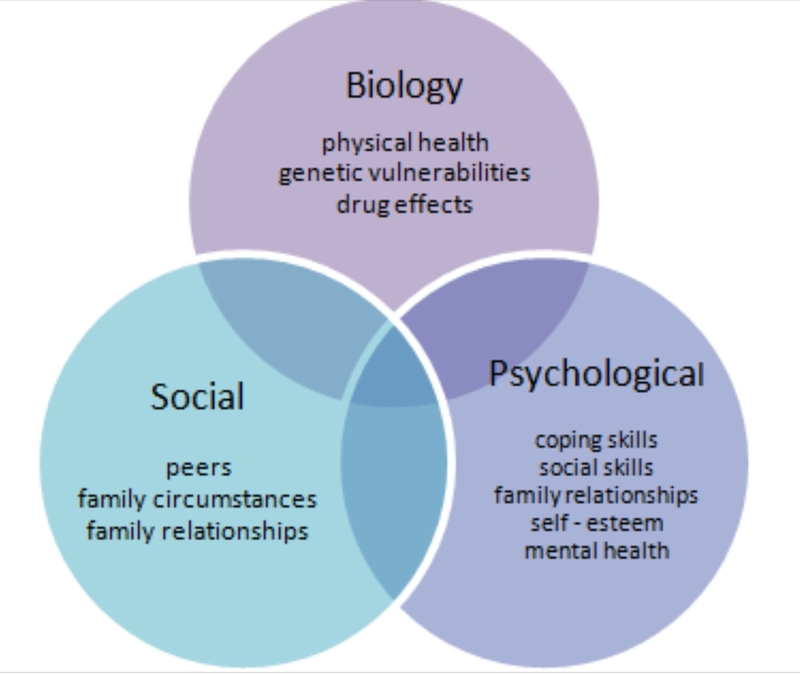 It will look at some of the broad over-arching themes of the course such as the biopsychosocial model of health and ill-health and how they relate to each other. Since students come from a diverse range of perspectives, different bits of the course can cause difficulty for different students. For example, a student without a science background might find the biology difficult, whereas a person who has done science might find some social science concepts problematic. In addition there will be a gentle introduction to experimental methods and diagnosis, which is an important part of SDK228. What does the weekend offer? The SDK228 Springboard Weekend will offer a full programme of eight talks, running from Friday evening (registration from 3pm; dinner at 6pm; evening lecture at 8pm) until Sunday tea time (3.30pm). As well as providing an introduction to, and overview of the course, it will be an ideal opportunity to meet with other students who are about to start SDK228 at the same time as you and also to talk to some of those involved in the production of the course, who will be tutoring on the weekend. The weekend is being held in parallel with other events for psychology courses so there will be the chance to meet and talk with students who have already studied SDK228 and get some first-hand opinions and tips from them. Professor Frederick Toates is Professor of Biological Psychology at the Open University, where he has over 35 years experience of teaching and tutoring. An author on SDK228 as well as many OU other courses, including SDK125, DSE212, DSE141 and SD226, his most recent book is Biological Psychology (3rd edition, Pearson Education, Harlow), which forms a popular and recommended text in a number of universities throughout the world. His book on B.F. Skinner has also recently been published. Fred has taught undergraduate classes not only in the UK but also in Moldova, Romania, France, Germany, Denmark, Sweden and the USA. Many of you will know Professor Toates from his involvement in the student forums, where he often provides very helpful and timely explanations in response to students' queries. Professor Neil Frude has been tutoring at OUPS events for many years. He is a Consultant Clinical Psychologist within the NHS, Research Director of the South Wales Doctoral Course in Clinical Psychology and a Fellow of the British Psychological Society. He has published a number of books on topics as diverse as family relations, violence and clinical psychology and devised the first “book prescription scheme” for delivering self-help therapy for anxiety, depression and other problems. Such schemes now operate nationally across England, Wales and several other countries. These days, Neil’s major preoccupation is Positive Psychology (as he put it: “These days, I’m up to my eyes in Happiness”). Students really appreciate the way in which Neil uses his enthusiastic teaching style and his clinical experience to bring psychological issues to life. Neil was the external assessor for SDK228. Please note that this is a paperless event. To be more environmentally friendly and to help manage our prices we will email any relevant handouts to all registered attendees, either in advance so that those who need printed versions have plenty of time to organise these, or shortly after the event if the tutor has decided that this is more appropriate for their lecture. These are for attendees' personal use and may not be shared. We'd like to thank our tutors for working to ensure that their presentations do not contain material to which they do not have copyright and for making them available in this way. And in advance, we'd like to thank all of you who support us in actively contributing toward a paperless environment and saving a few trees along the way ! Costs are fully inclusive of all accommodation, meals, tuition, handouts and also include social events. Please note that all meals are still included in the non-residential option. The lectures are conducted in lecture theatres within the University campus, and you will be provided with a timetable of talks and lecture notes on arrival. If you book the residential package then you will have a room in student halls complete with bedding, towels, a hairdryer, coffee making facilities and desk. Wifi is also included. Ensuite rooms include a bathroom with toilet and shower while standard rooms share toilet and shower facilities on the same floor. There are welcome drinks and also a psychology book stall, and these are both excellent places to meet other students. All students and staff wear name badges, so it is easy to find somebody to help if you have any questions. You can enjoy your meals with a group of students in the comfortable dining room. The food is fresh, healthy buffet style catering, and there is something to entice everyone. All meals are included in the price of the weekend. Finally, whilst most students leave exhausted from the learning and socialising, they comment that it is such a worthwhile weekend, and we see many of them each year as they progress their studies! The weekend takes place at Conference Park, University of Warwick. Accommodation is in single bedrooms on campus. Warwick is an award winning conference venue with excellent facilities. Access to the sports facilities, including the swimming pool, are included in the price. The university's central location with excellent transport links makes it easily accessible from all over the UK and Europe. There is ample free car parking. Click here for satnav postcodes and directions to the University of Warwick. For campus maps go to Warwick Campus Maps.